Suppose I'm replacing batteries in some powerful device like a flashlight - the flashlight will not even run on those batteries but some low power device like a TV remote or a wall clock will continue running on them for months. So there's a lot of usable energy in those batteries, just the flashlight can't make use of it anymore. 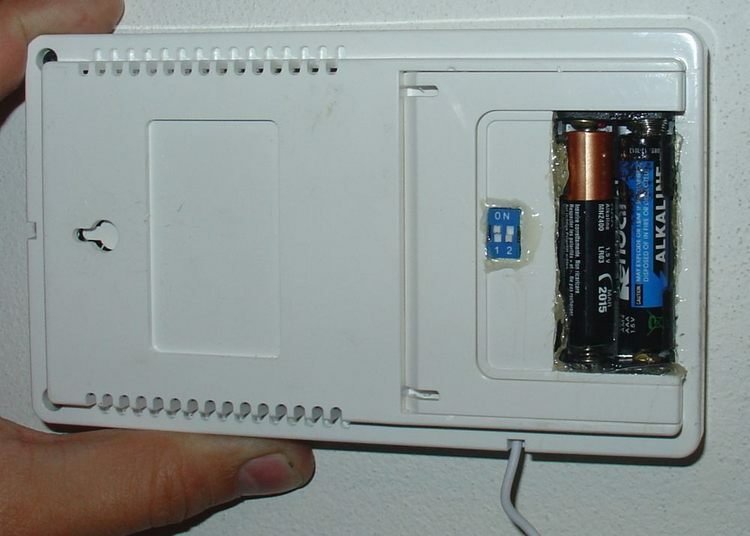 Besides using those batteries in wall clock (the problem is you run out of wall clock faster than you run out of half-drained batteries) what else can be done to give them a second life? I've seen some marketing projects like this one from Duracell which I personally find incredibly stupid because they wasted a ton of wire and a gazillion of LEDs just to build a stupid sculpture but not a working battery management system that would allow to actually prevent half-drained batteries from being disposed (recycled) prematurely. Is there any known practically working solution? current - When a device needs more power it takes higher current. (or needs higher voltage -> batteries connected in series) As the current rises the voltage drops down. See the internal resistance which contributes to the voltage drop below. internal resistance - Higher internal resistance causes larger voltage drop and also higher energy loss. (The energy transforms to heat inside the battery.) The internal resistance is higher in older and lower-quality batteries. So lower the current and voltage the second device needs - more power it can utilize from a partially discharged battery. Other possibility is to build a power source which will need relatively low voltage per single battery cell. In fact some modern devices use more and more efficient power management circuits. The devices need low voltage inside which also helps low power consumption. The low voltage is produced by a power efficient switching voltage stabilizer/regulator which can possibly operate with wide range of input voltage so that batteries can be efficiently discharged to a low voltage and more energy can be retrieved from them. It is certainly possible to construct a power source which will generate stabilized electrical power from a possibly large number of half-discharged batteries by using a switching regulator. I have never seen a mention of such a device. The procedure of replacing the batteries would be probably annoying. Because of dependability of such a power source (varying run-time) I would imagine its use for example for charging of other batteries e.g. in cell phones. Because partially discharged batteries have various properties they cannot be effectively used connected in series. On fully discharged cells connected into the circuit there would be unnecessary losses and they can even leak the electrolyte. For this reason there should be a separate regulator for each cell which makes the device more expensive. In my opinion it is practical to use half-discharged batteries in a low power demanding devices mentioned above. Regarding sustainability it is best to avoid using batteries as much as possible. If you use them, prefer low self-discharge and rechargeable batteries (accumulators) with minimum of dangerous substances. Also prefer low power devices. I've rebuilt two single-battery operated appliances in our home to a "battery juicer". I'll describe one of them here to explain the idea, the other one is remade in a similar way to this one. Both of them operate happily with half-drained batteries and I've reached the balance of incoming half-drained batteries and draining them almost totally in those appliances. There are two switches and three diodes added to the circuit. Those are germanium diodes taken from an old HDD (reused :), each with 0.3V potential drop in forward bias. When the batteries have enough power I turn off both of the switches, which lowers the voltage of the bank by 0.9V. With less powerful batteries I switch on switches 1 or 2 to shortcut the diodes. The decrease is 0.3V or 0.6V. In the last stadium I switch both switches on and 1V is reached by two 0.5V batteries. When I want to deplete the batteries to 0V, I replace one of the almost empty (0.5V) batteries with a half-depleted one (1V) and run them until the death of the weaker one. This is in fact the most common situation because once you have not equally drained batteries, one of them is going to die earlier and will be replaced. At first I started with resistors, not diodes, but their voltage drop depends on the current - when the current fluctuates, the voltage drop changes too. This is not wanted, diodes provide a constant voltage drop to the bank. Tweaks: more batteries can be grouped to reach a better use of used batteries. 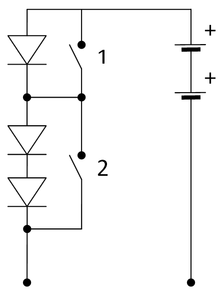 But then more switches are needed to regulate the wider scale of voltages. My other appliance is using a bank of 3 batteries, but they are external, because they wouldn't fit inside. There is a small DIY circuit called a "joule thief" that will take a AAA or AA battery down to about a half a volt or less. Most of my AAAs are from my computer keyboard which starts acting up when the battery reaches about 1 volt. I can take that battery and put it in a joule thief circuit and it will run an LED for maybe 24 to 48 hours. The joule thieves I make only take the battery down to about .7 volts, but there are better ones that will take it as low as .35 volts. Here's a link to a Youtube video that shows how to make the circuit. It can be made from components salvaged from old electronics too. The guy in the video is an expert, so I'm pretty sure if you followed his instructions exactly it might take the battery down to maybe a third of a volt. The LED would probably run for several days on a dead battery as opposed to my 1 or 2 days. Not the answer you're looking for? Browse other questions tagged waste reuse batteries waste-minimisation or ask your own question.